When it comes to the comfort, every little detail matters. Often small things are crucial in achieving comfortable, simple to use and looking modern bathroom toilets. Convenient one piece bathroom toilets, comfortable shapes, attractive designs of toilet seats and pleasant materials for toilet covers are important elements of modern bathroom design. 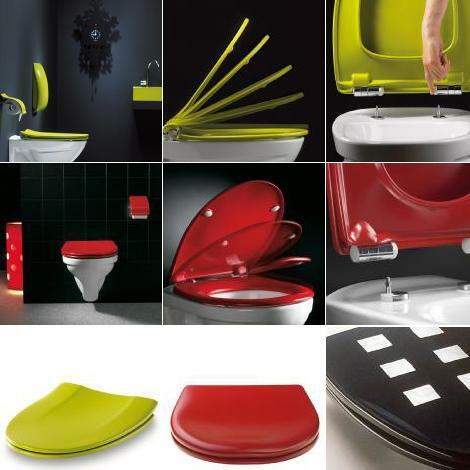 Modern toilet seats and covers should be practical, ergonomic and hygienic. The best bathroom toilet seats provide a few additional functions that improve their designs. 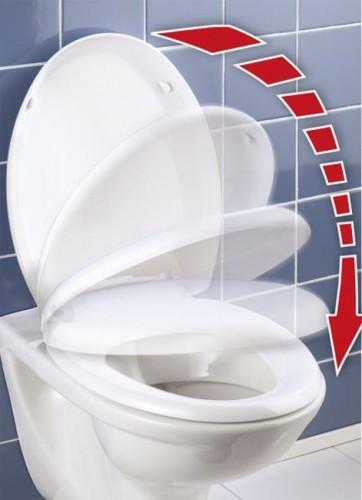 A heated toilet seat, a padded raised toilet seat, a smooth toilet cover lowering function, a scale, incorporated into a toilet seat, an easy to lift-off function allowing to remove an entire toilet seat, a back support and convenient handles improve functionality of modern bathroom toilets. Many modern bathroom toilets extend their functionality of the toilet bowl by turning these bathroom fixtures into a space saving combination of a water closet and a bidet. Some modern bathroom toilets are very innovative and eco friendly, using water from a washer and saving energy. All these different and interesting designs require a toilet seat cover which makes modern toilets comfortable and pleasant to use. The most popular bathroom toilets have elongated toilet seats shapes, made of man-made polymer materials or natural materials, like wood and metal. Colorful or white and black contemporary water closet designs can be made of a few types of solid wood, various metals, – stainless steel, aluminum, iron or bronze, and high quality hard plastic materials. Adding a modern toilet seat and a cover is the final touch to stylish, comfortable and functional bathroom design. All modern toilet seats can be divided into two groups: traditional, modern or in vintage style bathroom toilets with seats and covers made of wood, metal or hard plastic, and contemporary toilet seats with padded and heated covers made of soft man-made materials, like soft polyurethane foam and soft polymers. Contemporary bathroom toilet seats and covers are more comfortable and technologically advanced than old fashioned toilet seat models in traditional or vintage style, but less durable than wooden and metal toilet seats, made of traditional hard materials. Modern bathroom toilets accessories, seats and covers made of hard wood, like oak or cheery wood, are pleasant to use, practical and very attractive. The oak toilet seat and cover look elegant and warm, feel comfortable and offer eco friendly products for interior decorating with this beautiful and natural material. Wooden bathroom design with toilet seats, covers, storage furniture and bath accessories in vintage style is very popular. Wooden bathrooms are warm and very comfortable. Made of warm and eco friendly material toilet seats are the best options for simple and natural bathroom design. The best modern bathroom toilets are made of warm material, like wood, or feature a heated toilet seat. It is important to pay attention to water closet hardware also. When choosing toilet seat cover design, select the best materials and designs for your bathrooms. Toilet cover hardware can be made of hard plastic or brass, which is more reliable than plastic and looks more attractive, adding elegant style to bathroom design and decorating. Contemporary one piece bathroom toilets with easy removable water closet seats and toilet covers are very convenient and practical, allowing quick and simple bathroom cleaning. Contemporary bathroom toilets have additional features and a few functions that improve water closet seat designs. A heated toilet seat, a padded raised toilet seat, a smooth toilet cover lowering function, a scale, incorporated into a toilet seat, an easy to lift-off function allowing to remove an entire toilet seat, a back support and convenient handles make modern bathroom toilets more comfortable, multifunctional and easy to use. Bathroom toilets with warm seats and covers that slowly roll down are great, pleasant and safe for small children and elderly people. These modern bathroom toilets are safe and comfortable. The seat cover will not accidentally drop on kids fingers, and the warm seat add luxury to modern bathroom design.